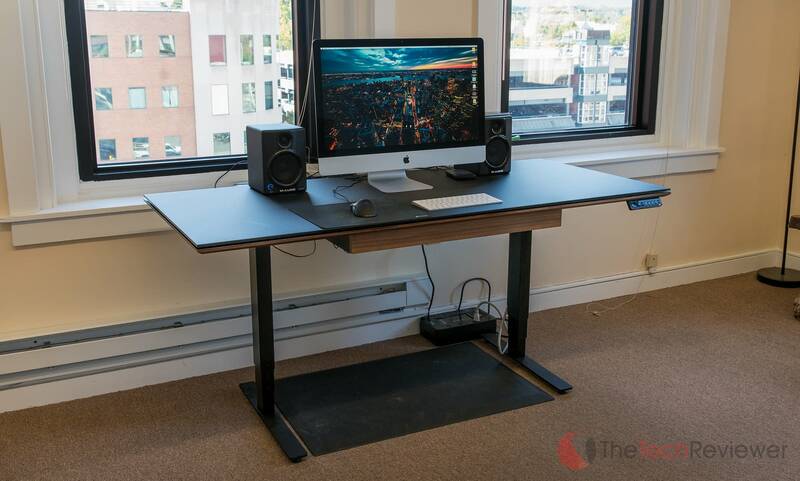 The BDI Sequel Lift Desk is a high-end sit/stand desk for an affordable price. 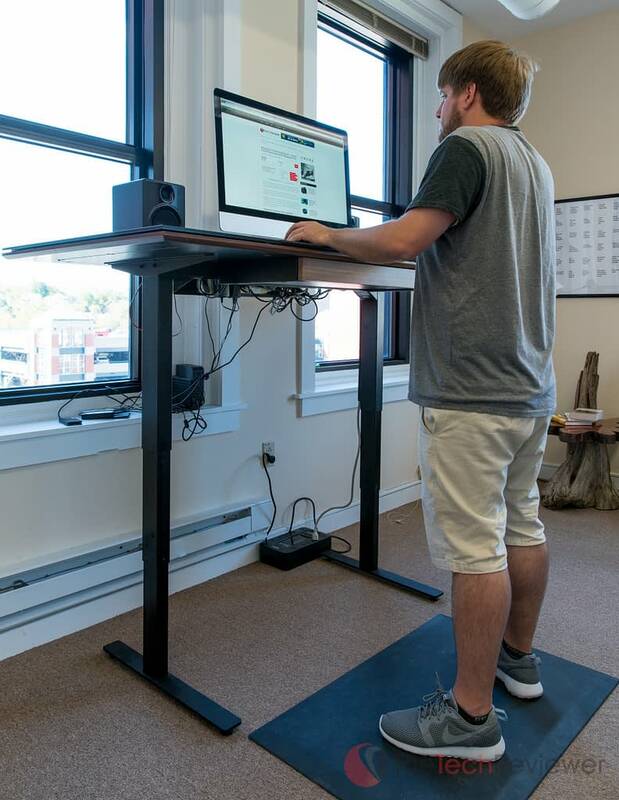 In the world of ergonomic office furniture, some of the hottest products right now are sit/stand desks. There are many models offered on the market, and it can be difficult to choose correctly as varying build qualities typically differentiate the higher priced models from the lower end ones. 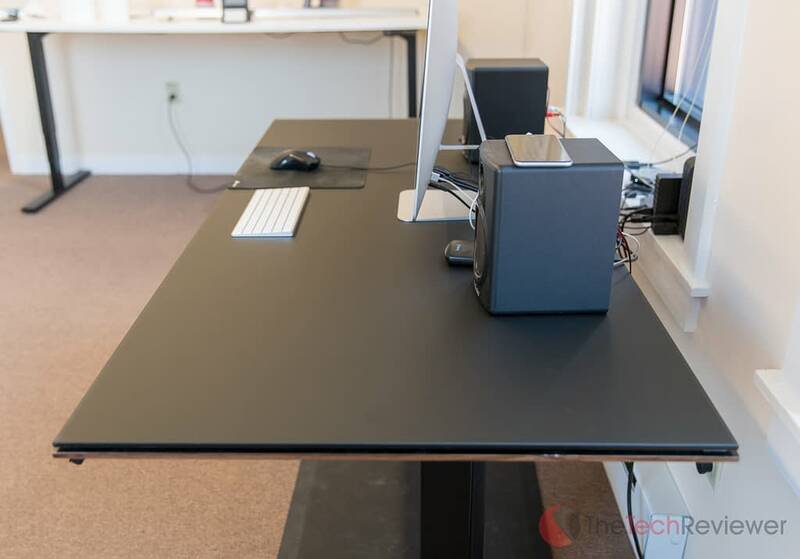 We recently were reached out to by BDI, a well-known designer of contemporary home furnishings, who gave us an opportunity to test out their new Sequel Lift desk. 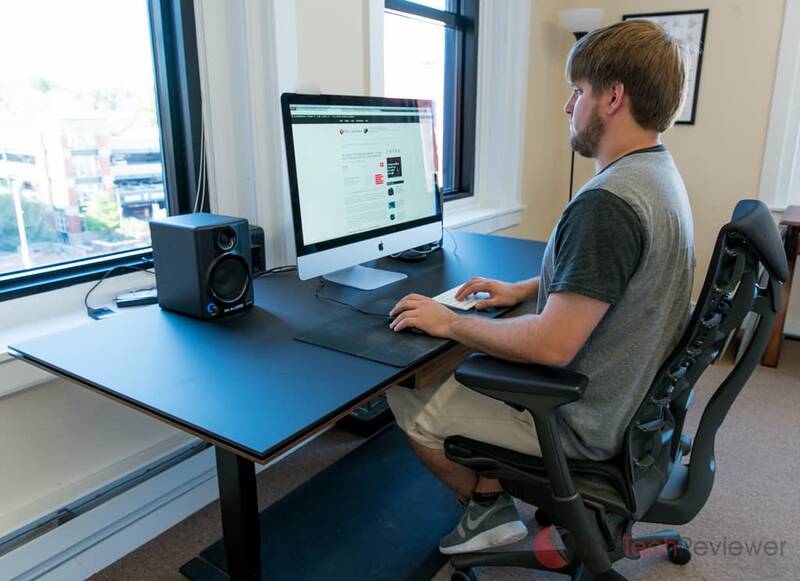 The desk is offered in two models, a medium-sized version priced at $1,399 and a larger version priced at $1,599. 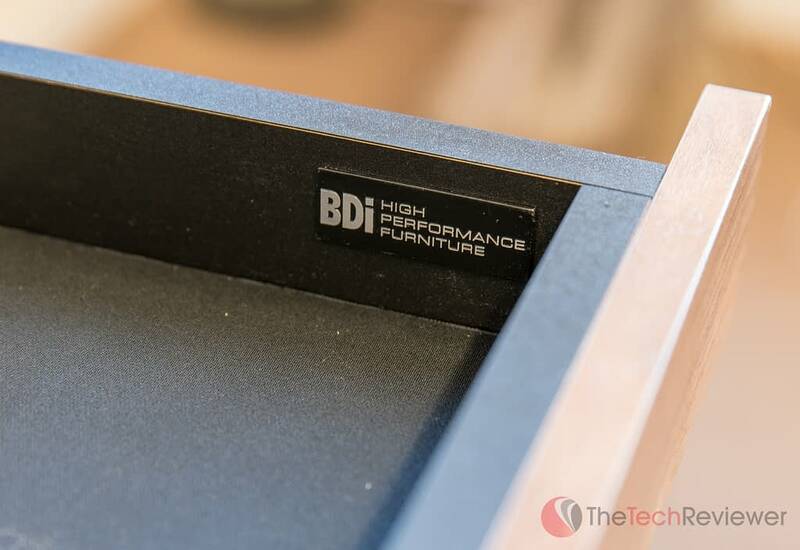 BDI provided us with a sample of their Sequel Lift Desk in the large variant to make this review possible. However, this is not a paid endorsement by BDI and all opinions expressed in this article are unbiased based solely on our testing during day-to-day use after a period exceeding 30 days. I'll be referencing my experience with the larger 6052 version, but most of these observations will still apply to the smaller 6051 model. 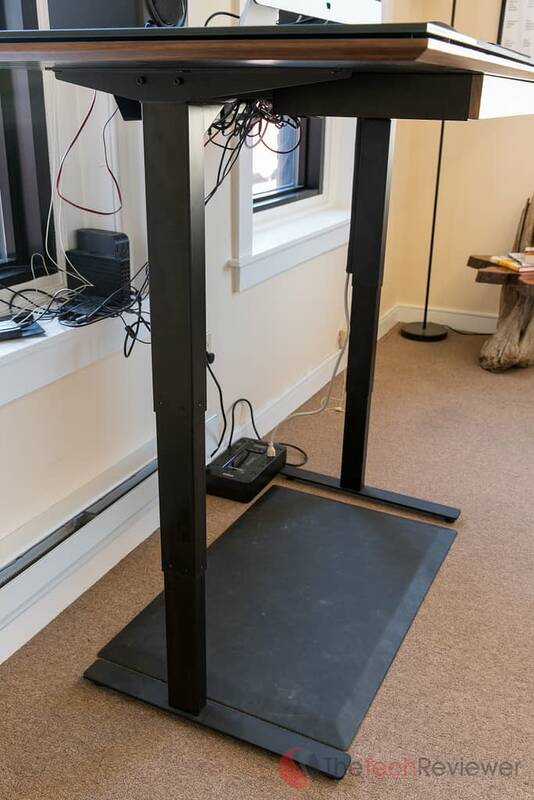 The Sequel Lift Desk was delivered via freight right to my home in three separate boxes with a total shipment weight of 254 LBs. I was able to move the boxes from my garage into my office unassisted although I didn't have to climb any stairs or obstacles so you may require someone else to help transport the boxes to an open area where you plan to build the desk. From there, the assembly was rather simple. The included instruction booklet was detailed enough to follow step-by-step without any gray areas, and there is even a YouTube tutorial that you can follow along with should you need it. At this price-point, I was glad to see it included the necessary hex keys as made the assembly easier as I didn't have to track down any extra tools for completion. After following the instructions, I had the desk built and ready to use in under 90 minutes. I would recommend having another person help you lift the top pieces into place, but I was able to manage it alone without too much trouble. 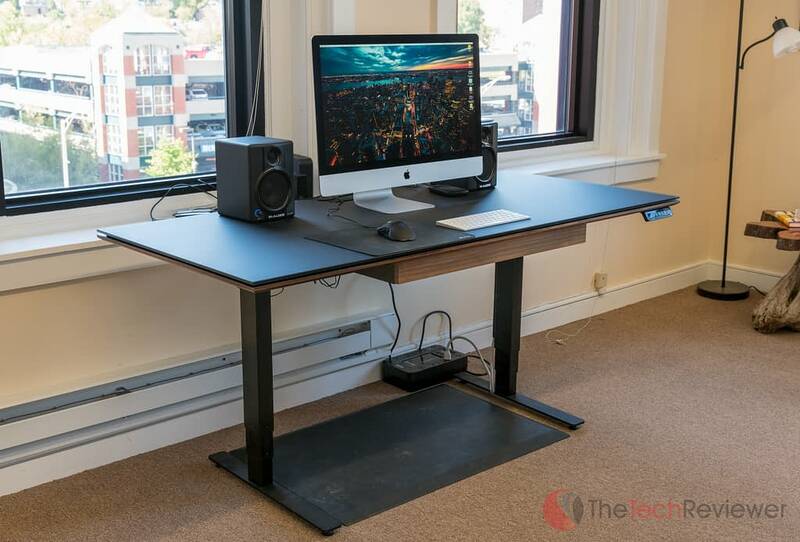 Something I noticed about the assembly compared to the cheaper Uplift 900 sit/stand desk we reviewed in the past were minor, but useful elements BDI added for ease of use and stability. 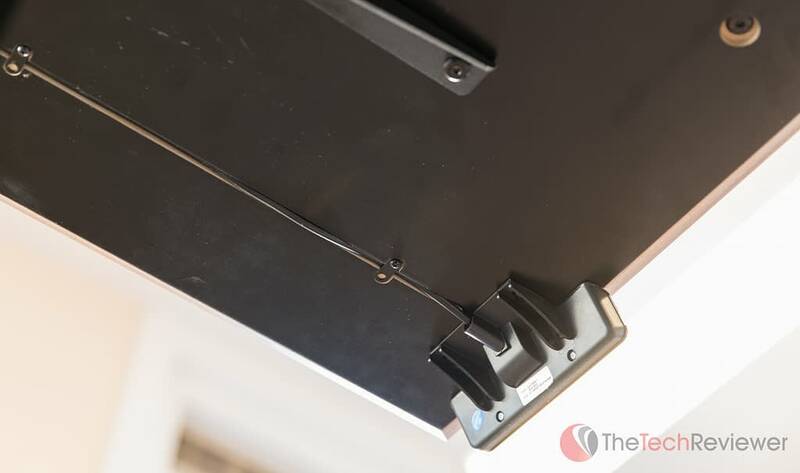 These included contoured lines in the base of the desk for inserting the necessary cables to operate the electric motor/keypad in addition to plenty of bolts to ensure a rigid connection between the base and the legs. The only issue I had in the assembly process had to do with my mistake of using a powered screwdriver instead of a traditional hand-operated screwdriver. This resulted in me accidentally stripping out the default screw placement of the motor in the base of the desk. Fortunately, I was able to shift this location an inch to the left and reinsert the screws by hand without causing any problems. 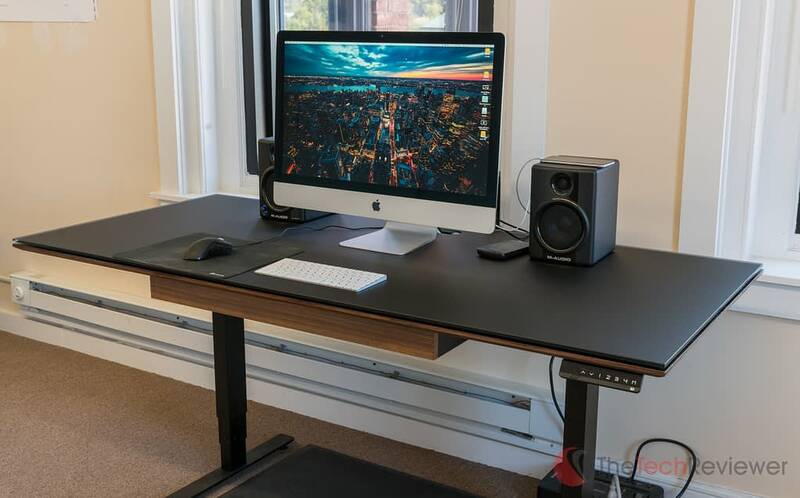 The Sequel Lift is an attractive desk and the combination of the micro-etched black glass top, and the natural walnut finish is pleasing to the eye. 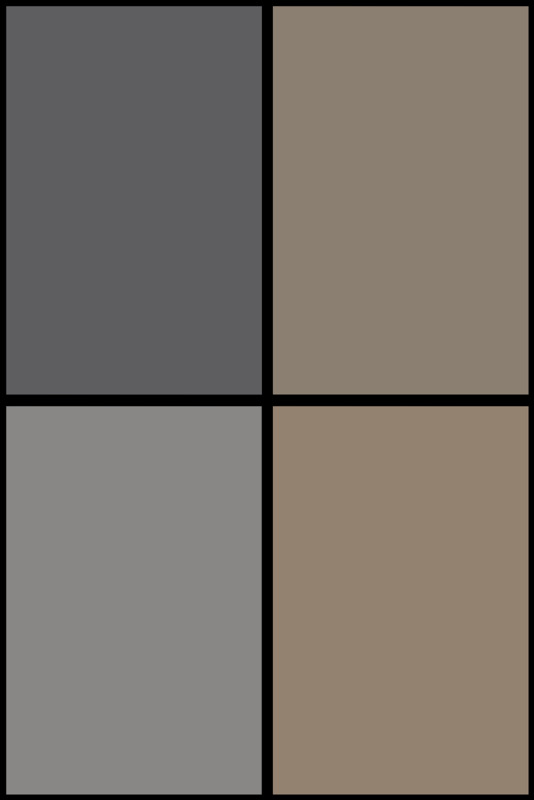 Besides the natural walnut color option, you can choose natural stained cherry, espresso stained oak or chocolate stained walnut. This finish is only visible on a small laminate strip near on the base of the desk, so it isn't too significant of a decision. Starting from the bottom up, the legs are thick and durable with a similar three-piece construction like that found on the Uplift 900. The legs connect to the base of the desk which is the portion that shows off the laminate finish, in my case, this was natural walnut. This piece was the only piece on the desk that I question its durability over time as it appears to be made of MDF, a commonly-used material known for being cost effective for production yet lacks the durability of real wood. The use of this material is why I was able to strip the screw hole so easily compared to that of real wood, and it also endured some minor scratches throughout the transportation to our new office space. 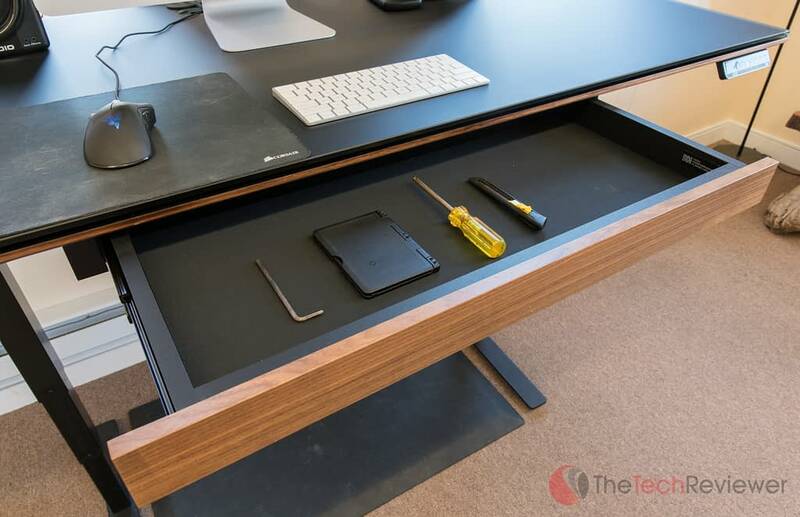 Fortunately, this material is only used for the base of the desk (as well as the drawer if you decide to purchase it) so the glass top offers both stability and strength for holding the various contents that the desk will need to support when in use. 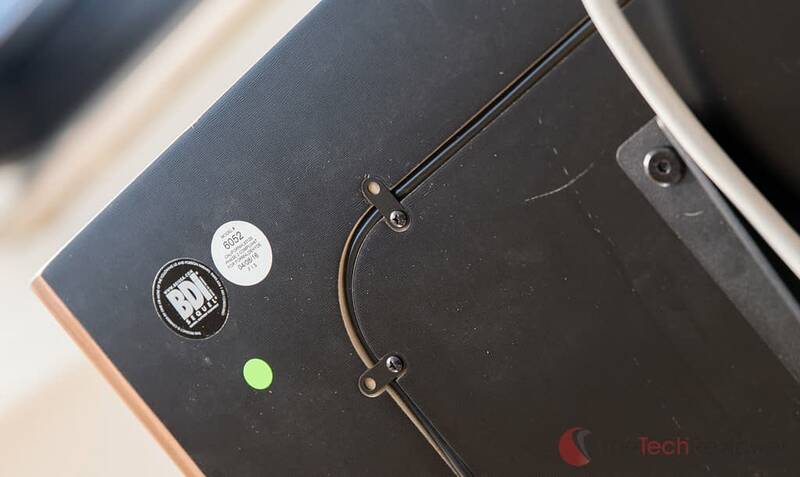 You can mount the keypad on the left or right side of the desk and is identical to the one used in my Uplift 900 only with different branding engraved on it. Having a glass top was something I wasn't sure if I'd like when it came to aesthetics, but the frosted black finish is elegant and practical as it doesn't reflect sunlight and showcases a clean matte finish. However, it does show dust and grime quite easily so you'll want to be sure to wipe it down once it awhile to keep it looking its best. I do have a few small white marks in the glass top shown from use, but BDI has another tutorial that shows you how to “refresh” the top using glass cleaner, a Scotch-Brite pad and a dry cloth. Cable management was a top priority with the Sequel Lift, and BDI did an excellent job implementing this into their design. 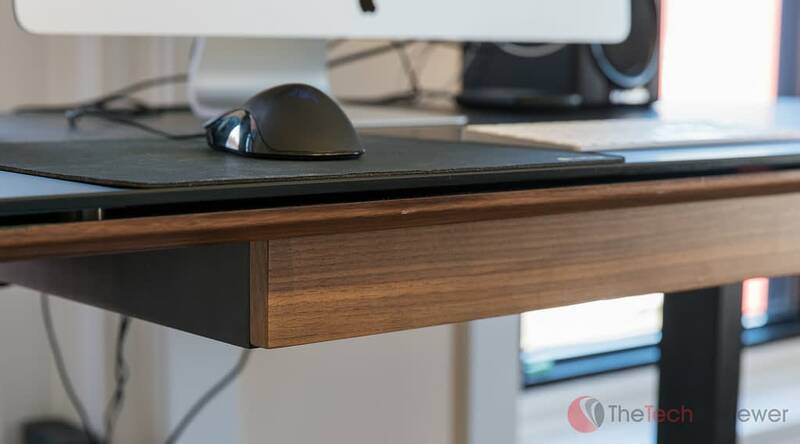 They cut a single large grommet cut into the back center of the desk that leads to an integrated metal cable tray which secures to the base of the desk. 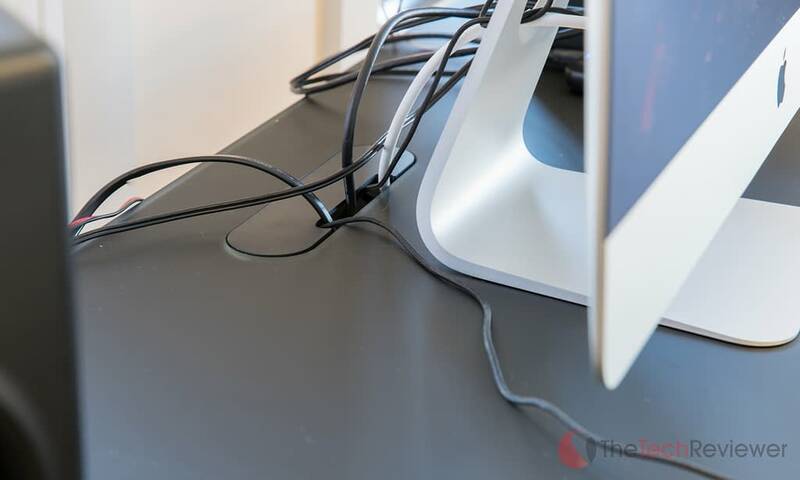 Included with your desk is a glass cutout that covers most of the grommet while leaving a small slit for you to thread cables through leaving an ultra-clean finish. 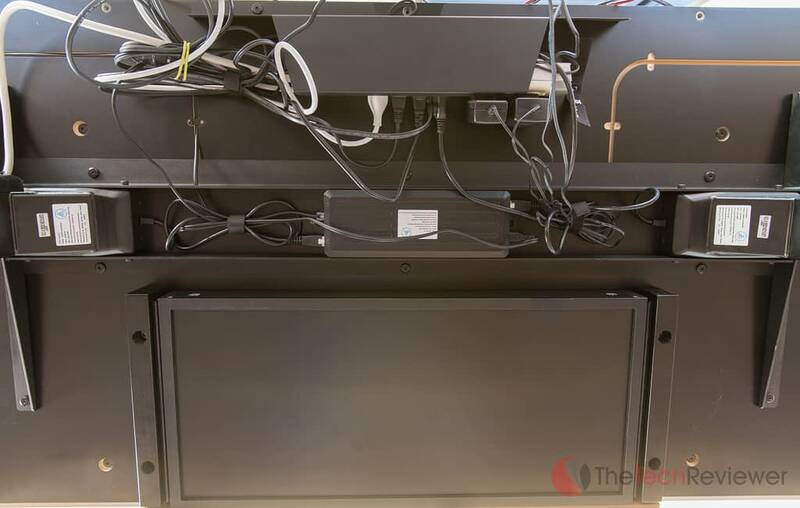 It is possible to secure a power strip in this cable tray with the included velcro strips, but a power strip doesn't come with the desk. 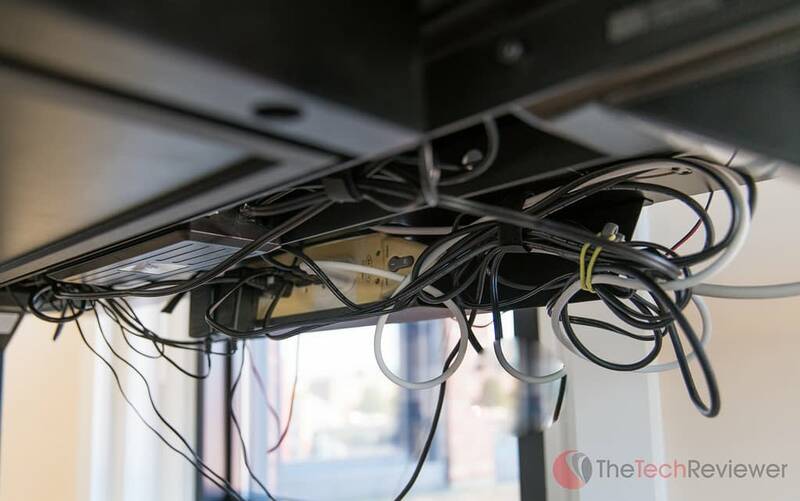 You do however receive a rubberized cable route that adheres to the back of one of the legs allowing you to run the cable down and help hide it from view. I've replaced my Uplift 900 with the Sequel Lift for the past month and a half, and it has been a pleasant transition. It is true that the version of the Uplift 900 that I own offers significantly more surface area to work with at 80 inches wide, yet the 66 inches provided by the larger Sequel Lift model is plenty for my needs. The difference in build quality is noticeable from the start, and one of my favorite things is that when the legs are extended to standing height, they don't wobble when I type as they did with the Uplift 900. I think the smaller surface area and rigid build quality helps hinder this problem and prevent unnecessary movement from all heights. 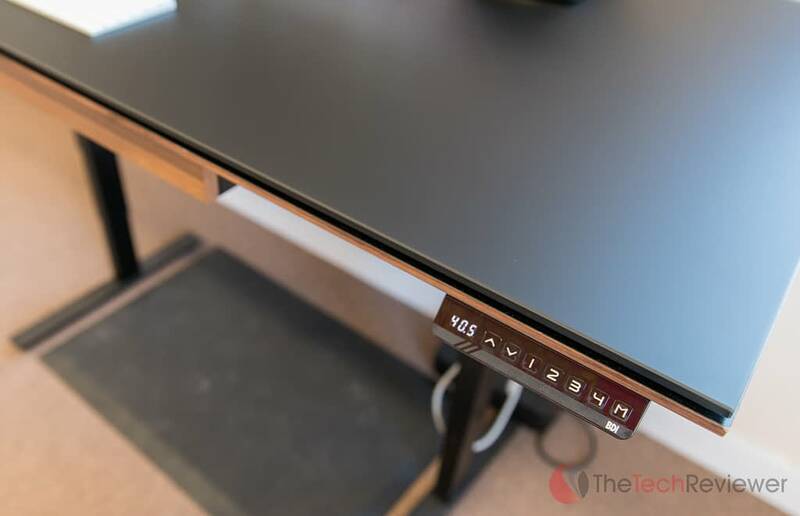 My review unit came with the Sequel 6059 drawer which retails for a rather steep $229 with a choice of the same four laminate finishes to match your desk. Like the base, the build material isn't stellar as mine arrived with a notable scratch on it although it gets the job done nicely offering ample room for storing various desk-related office supplies. Something unique that I didn't expect with this drawer is that it ships with a nice fabric insert (closely resembling that of a mouse pad) that gives the drawer some padding and helps keep things from unintentionally slipping about. The legs extend from 24.7″ all the way up to 50.3″ with four programmable height settings to save for future use. 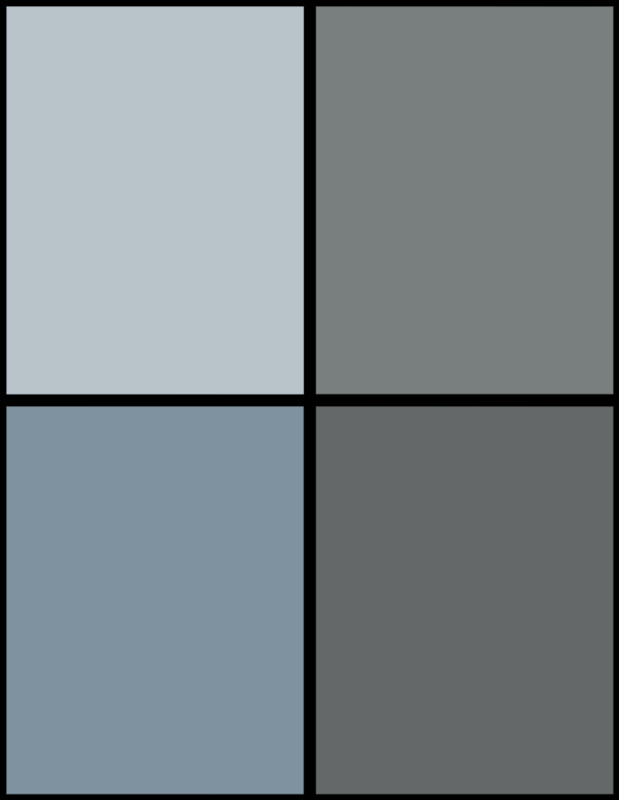 Being 5'9″, I prefer my sitting height at 30.4″ and my standing height at 50″ although you've got plenty of room to choose height options to cater your specific preference. Just like in my Uplift 900 review, I absolutely think a proper standing mat is required to keep you feeling good after standing for long periods. I still use the CumulusPRO Commercial Grade Anti-Fatigue Comfort Mat as it has held up well after nearly a year of use and prevents my feet from aching after long work sessions. 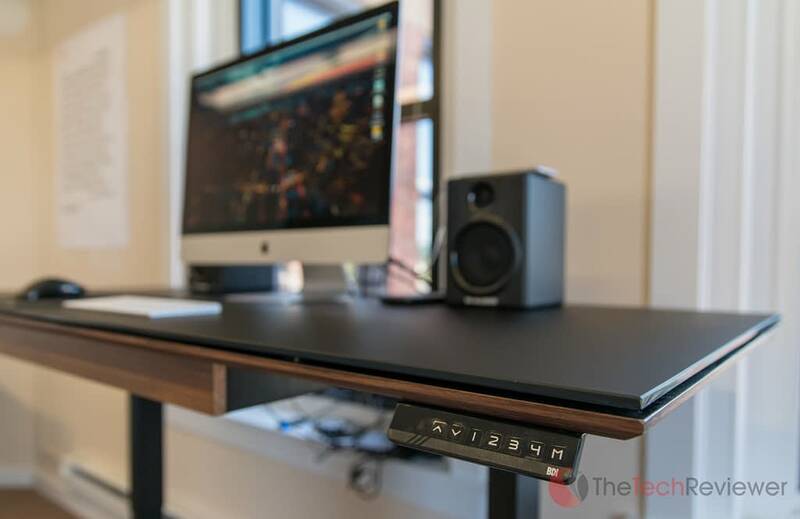 BDI's Sequel Lift sit/stand desk lived up to my expectations offering a more secure, elegant and refined sit/stand desk when compared to a cheaper competitor such as The Human Solution's Uplift 900. If you don't mind spending a bit more to buy a product that will last for many years to come, and the Sequel Lift is a more justified purchase than the Uplift 900 from my experiences as I wouldn't hesitate to spend the extra money if you prioritize quality over cost. In most cases, I would recommend the larger 6052 version as the extra width and depth make it versatile for so many uses, but for those on a budget or in a tight workspace, the smaller 6051 variant remains a solid buy.